[miau] Jackpot Jewels is a five-reel, 20 line-exclusive video slot machine game. Players can use the five spinning reels to form their winning combinations. Payline is enabled after putting a coin on the slot machine. The winning combinations of the symbols along each enabled payline are checked by the computer when the reels stop spinning. Jewel jackpot has several features including Scatter symbols, Wild Gentleman symbols, a Free Spin Bonus game and Progressive jackpot. The jackpot increases in value every time you bet. 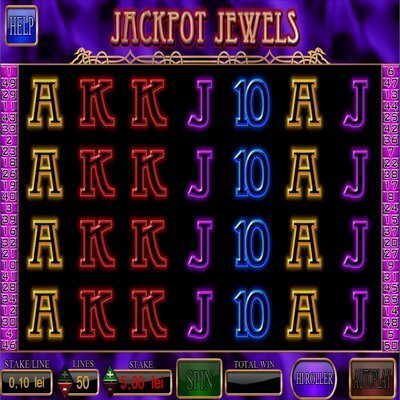 Players can play Jewel Jackpot for free or to earn money. The denominations for this game range from 0.05 to 0.20 per pay line bet. Players can bet for as little as 1.00 per spin. The highest amount of bet that you can place is 4.0 per spin. The regular jewels will pay you a maximum of 5,000 credits per line bet. These payouts are only made according to the paytable. The Green Gem and Blue do not need to appear in a line win. The regular symbols in this game pay left to right in consecutive order. This includes the Blue and Green Gem symbols. If you win Bonus or Scatter, your win is added to the payline wins. Players can use the Gentleman symbol to substitute all other symbols except the Green Gem and Blue Gem scatter symbols. The wild symbol in this game is the Gentleman symbol. This is the symbol that you can use to substitute other symbols to complete winning combinations. You can have multiple Wild symbols on reels 2, 3 and 4. Gentleman symbol is used to trigger Jewel Jackpot Bonus Round game. The Gentleman symbol should appear at the same time in reels 2, 3 and 4 for the game to be triggered. It is important to note that the Gentleman Wild symbol cannot be used to substitute the Blue Gem symbol in Major Progressive Jackpot or the Green Gem symbol in Minor Progressive Jackpot during the Jewel Jackpot Free Spin Bonus Round. You will only be paid for one winning combination per payline. If you have more than one possible combination, you will receive payment for the highest possible combination only. Progressive jackpot is a constantly accumulating prize. There are two types of progressive jackpot; minor and major jackpot. The only difference between these two values is the amount involved in each jackpot. Both jackpots do not have an upper limit value. This means that your jackpot will keep on increasing. When you win the minor jackpot, the amount will reset to £500 while the major jackpot will resets to £4,000 once it is won. A major jackpot win is registered when 5 scattered Blue Gems are spotted anywhere in consecutive order during a free spin. On the other hand, a player wins a minor jackpot if during a Free Spin game, 5 Green Gems are spotted anywhere arranged in a consecutive order. You can improve your chances of winning a progressive jackpot by increasing your wager in each game. You can only win this jackpot during the Free Spin Bonus Round games. The amount won may be displayed in another currency other than the one you are playing in. This amount is normally converted to your currency and added to your account.